1 ESGE/EASL recommend that, as the primary diagnostic modality for PSC, magnetic resonance cholangiography (MRC) should be preferred over endoscopic retrograde cholangiopancreatography (ERCP). Moderate quality evidence, strong recommendation. 2 ESGE/EASL suggest that ERCP can be considered if MRC plus liver biopsy is equivocal or contraindicated in patients with persisting clinical suspicion of PSC. The risks of ERCP have to be weighed against the potential benefit with regard to surveillance and treatment recommendations. Low quality evidence, weak recommendation. 6 ESGE/EASL suggest that, in patients with an established diagnosis of PSC, MRC should be considered before therapeutic ERCP. 7 ESGE/EASL suggest performing endoscopic treatment with concomitant ductal sampling (brush cytology, endobiliary biopsies) of suspected significant strictures identified at MRC in PSC patients who present with symptoms likely to improve following endoscopic treatment. 9 ESGE/EASL recommend weighing the anticipated benefits of biliary papillotomy/sphincterotomy against its risks on a case-by-case basis. Strong recommendation, moderate quality evidence. Biliary papillotomy/sphincterotomy should be considered especially after difficult cannulation. 16 ESGE/EASL suggest routine administration of prophylactic antibiotics before ERCP in patients with PSC. 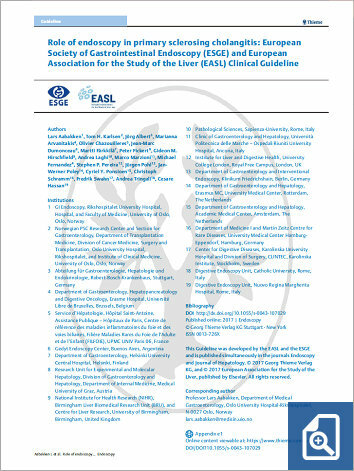 17 EASL/ESGE recommend that cholangiocarcinoma (CCA) should be suspected in any patient with worsening cholestasis, weight loss, raised serum CA19-9, and/or new or progressive dominant stricture, particularly with an associated enhancing mass lesion. 19 ESGE/EASL recommend ductal sampling (brush cytology, endobiliary biopsies) as part of the initial investigation for the diagnosis and staging of suspected CCA in patients with PSC.